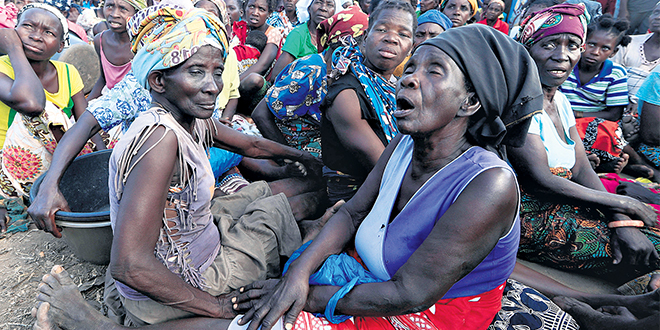 LOSS, interruption and destruction – millions of people were desolated after Cyclone Idai hit Mozambique, Zimbabwe and Malawi late last month. Jesuit Conference of Africa and Madagascar president Fr Agbonkhianmeghe Orobator said his thoughts and prayers were with the hundreds who had died and the millions affected. “The Jesuits in Africa and Madagascar join the rest of Africa and the world in mourning the loss, interruption and destruction of lives and livelihoods caused by Cyclone Idai,” Fr Orobator said. “The scale of devastation it caused is enormous. “90 per cent of the city of Beira is reported to have been destroyed, floods have wiped out entire villages, key infrastructure such as roads, hospitals, schools, have been destroyed; one St Charles Lwanga School in Chimanimani in Zimbabwe was buried by a mudslide, causing the death of some students. “The devastation has made the affected areas difficult to access, hampering aid efforts by individuals and organisations. But, Fr Orobator said the real devastation was the lives lost, a toll that sits at 843 people, but is rising. And Fr Orobator named another sufferer – Earth. “… Disasters such as this one need not awaken only our sympathy towards humanity, but also our sympathy towards our planet, to God’s creation itself,” he said. About 400,000 hectares of crops, primarily maize, were washed away weeks ahead of the main April-May harvest, according to the World Food Program. Livestock and fisheries were also hurt. WFP executive director David Beasley visited Beira, the port city hit by the full brunt of the cyclone. He said people’s lives were devastated and people had no livelihoods now, “they’ve lost their homes, they’ve lost their farms, they’ve lost their crops, they’ve lost loved ones”. Mr Beasley said it would take everyone working together, governments and communities, to rehabilitate and prevent it from occurring again. A young Catholic from Beira was featured on the Jesuit Conference’s newsletter, Raul Chacuamba, who said the situation was not good – it was critical. “Many people are still with no food and water and it’s dangerous,” he said. “It will take some time to rebuild and return to normalcy. “Our churches have been greatly damaged, in one parish a big wall came down and broke all the benches, the church is now totally destroyed. 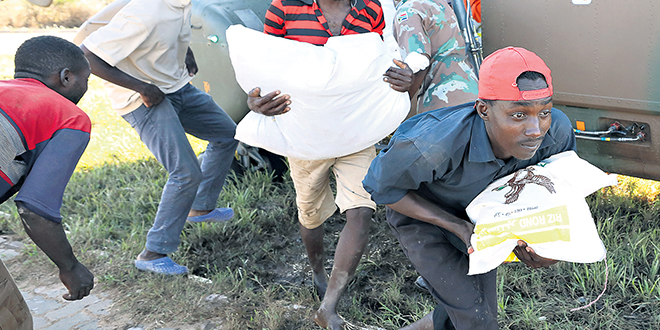 Feeding thousands: Workers offload food aid from a South African National Defence Force helicopter in the aftermath of Cyclone Idai near Beira, Mozambique. Rita Farriya lost her house in the cyclone. “Our house is gone, it is destroyed. Our clothes are gone, everything is gone,” the mother of two said. She, like thousands of others, fled to a primary school where Caritas was helping. “On the day of the floods, we came here,” she said. But hope was always there. Caritas has distributed food to 1640 families in Beira and in the city of Chimoio, Caritas set up a model shelter using 500 tarps. Beira Bishop Claudio dalla Zuanna said the church was determined to carry on. “We can’t only cry about the church (in Beira) that fell; but we have to look ahead,” he said. “In this devastation, we must look at how to rebuild in this area. Fr Orobator also said he was encouraged by the level of humanitarian assistance and called on everyone to do what they could. “Let us especially use this time of Lent to help those in need in Mozambique, Zimbabwe and Malawi in whatever means possible, as individuals, communities and organisations,” Fr Orobator said. Pope Francis led the way and donated $50,000 to each of the three affected countries, which would be distributed through the Dicastery for Promoting Integral Human Development. It was also announced the pope would venture to Mozambique as part of an apostolic visit in early September this year. The International Red Cross and Red Crescent Societies said the first cases of cholera were confirmed in Mozambique – but they were ready for it. IFRC Beira head of operations Jamie LeSueur said aid organisations would have to move “extremely fast to stop these isolated cases from becoming another major disaster”. “The Mozambique Red Cross and IFRC have been anticipating the danger of waterborne disease from the outset of this tragedy, and we are already very well-equipped to deal with it,” Mr LeSueur said. WFP has already provided food assistance to more than 150,000 and will reach all 1.7 million people as soon as possible.